At an event held in China, Huawei sub-brand Honor announced the successor to the popular Honor 6X, dubbed Honor 7X. The smartphone, keeping up with the latest trend, features a large 5.93-inch sized display with extremely thin bezels on all sides. Like its predecessor, the Honor 7X boasts a metal unibody design that gives it a premium look and feel. The display, as we mentioned above, measures 5.93-inches diagonally and offers 1080 x 2160 Full HD+ resolution and an 18:9 aspect ratio. On top of the actual display panel, we find a 2.5D curved glass layer like most other modern smartphones. Moving on to processing, the Honor 7X is powered by Huawei’s octa-core Kirin 659 64-bit chipset clocked at 2.36 GHz with a Mali-T830 MP2 GPU. The smartphone comes in three storage versions – 32GB, 64GB, and 128GB. All three versions feature 4GB of RAM and memory expansion up to 256GB with a Hybrid Dual SIM configuration. In the camera department, Honor 7X impresses with a dual-camera setup at the rear, comprising a 16 megapixel primary sensor and a 2 megapixel secondary sensor. The two sensors have been placed next to each other in a horizontal arrangement, alongside an LED flash. Slightly below the dual-camera setup, we find a circular fingerprint sensor. Connectivity features offered by the smartphone include Wi-Fi 802.11 b/g/n, Bluetooth 4.1 Low Energy, GPS with GLONASS, and 4G LTE. Inside the metal unibody body is a 3340mAh capacity battery, identical to the Honor 6X. That means the new model will not be a significantly better performer in terms of battery life. In terms of dimensions, the Honor 7X measures 156.5 x 75.3 x 7.6mm and weighs in at 165 grams. It runs on Android 7.0 Nougat OS out of the box, with the EMUI 5.1 custom skin on top. 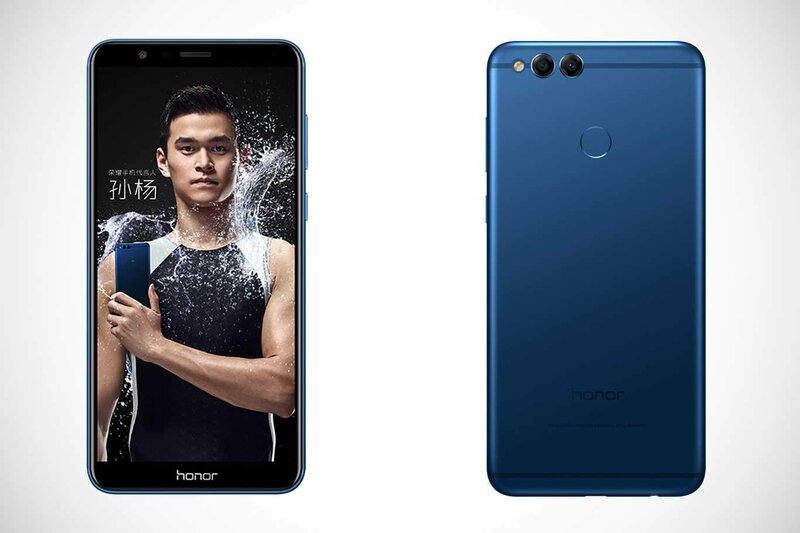 The new Honor 7X is now available for pre-order in China and will be available in stores from October 17th onwards in Aurora Blue, Black, and Gold color options. Prices start at 1299 yuan ($198) for the 32GB variant, going up to 1999 yuan ($304) for the top-end 128GB model. The 64GB model is priced at 1699 yuan ($258). Like the Honor 6X, we do expect the Honor 7X to be launched in select markets around the world before the end of the year.